Michelle Steinbeck was born in Lenzburg, Switzerland in 1990. She writes prose, poetry and drama; reportage and columns. She works as editor-in-chief at FABRIKZEITUNG and is the organiser of BABELSPRECH, a forum for young international poetry. 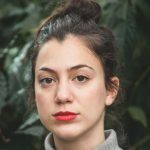 Her debut novel Mein Vater war ein Mann an Land und im Wasser ein Walfisch was published by Lenos Verlag in Switzerland in 2016 and was shortlisted for the Swiss Book Prize 2016 and longlisted for the German Book Prize 2016. Steinbeck lives in Basel. Michelle Steinbeck Author Michelle Steinbeck was born in Lenzburg, Switzerland in 1990. She writes prose, poetry and drama; reportage and columns. She works as editor-in-chief at FABRIKZEITUNG and is the organiser of BABELSPRECH, a forum for young international poetry. 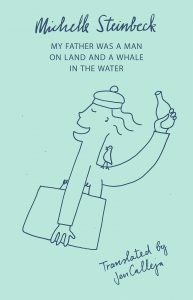 Her debut novel Mein Vater war ein Mann an Land und im Wasser ein Walfisch was published by Lenos Verlag in Switzerland in 2016 and was shortlisted for the Swiss Book Prize 2016 and longlisted for the German Book Prize 2016. Steinbeck lives in Basel.